Foam Lake has given video treatment to their single “Too Late”. The song is off their debut album, Force and Matter, released Oct 23 through Aporia Records. The video, directed by Levi Carleton, features frontman Paul Ross walking the snowy streets of Regina after a fight with his girlfriend. As he walks, the images switch between the couple’s happier memories as well as the fights. Ross eventually ends up at a bar where he meets his band and joins them on stage to perform the break-up song to his girlfriend in the audience. Foam Lake – Too Late from Echolands Creative on Vimeo. The Saskatchewan-based band was formed in 2008 as a union of the four Ross brothers. This year they have been showcasing at music festivals such as SXSW, Primavera Sound, Sled Island, Reeperbahn and CMJ. 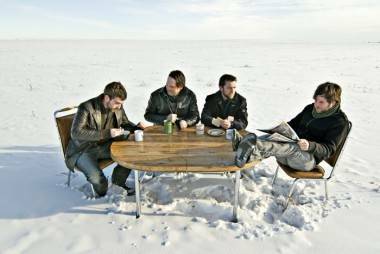 The band was also nominated for “Independent Album of the Year” at the 2012 Western Canadian Music Awards. This entry was posted in Features, videos and tagged bands, indie-rock, Music. Bookmark the permalink.